Do You Dare Enter the Hall of Claims’ Darkest Corner? By tying Farmers’ value to big cultural events, like Friday the 13th and Halloween, we could showcase the Farmers’ brand from a new (and spookier) perspective. In an effort to expand the scope and potential of The Stranger Claims campaign while being mindful of timelines and budgets, we created the videos exclusively with stock video, visual effects, color passes, and the talented J.K. Simmons’ voice work. Although using stock assets was a challenge, the restrictions motivated us to be even more resourceful and creative. We needed a suitable place for our Stranger Claims videos to live. Because these videos have a specific mood and style, simply posting them on Farmers’ YouTube channel or social feeds would feel sterile and out of context. And what better place to share these videos than a haunted house? Or, in Farmers’ case, the “Hall of Claims®’ Darkest Corner.” We developed an interactive, 360-degree environment to amplify the tone of the claim videos and give the viewers a more complete, immersive experience. Do you dare explore the hall and watch all five of the stranger claims? Check out the 360 experience or individual videos below. We applied the classic black-and-white, B-movie treatment for a woman who got into her car with an unexpected guest. We used a familiar Japanese horror-movie treatment to tell the tale of seven trees wreaking havoc on a barn. It's close encounters of the horticulturally inclined. When a mysterious monument of rubble appeared on a man’s driveway, we gave it the “Ancient Aliens” documentary treatment. A woman woke up to find an unyielding horde of deer destroying her barn, and it reminded us of those old zombie movies. 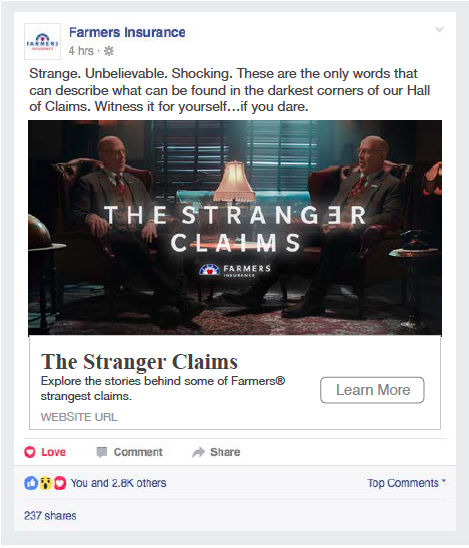 We promoted “The Stranger Claims” with varied social assets, including a Facebook canvas unit that introduced the campaign, teased each claim, and drove viewers to the full experience. We also leveraged Facebook’s 360-degree posts to give viewers an opportunity to explore the Hall of Claims’ darkest corner. “The Stranger Claims” reimagines the Farmers’ brand story in a new (spooky) context that's proving to be a big hit with our fans and customers. Helping kids develop an early love for books.